Utilizing over 2,500 manuscript pages, nearly 100 photographs, and more than four hours of audio and video, this website tells the story of a cornerstone achievement of twentieth century science. In 1926 Linus Pauling, then a promising young doctoral candidate, set sail for Europe to study quantum mechanics with an eye toward applying this new physics to problems in structural chemistry. Pauling's ensuing program of research would result in a remarkable series of landmark publications that revolutionized the scientific world's conception of how atoms join together to form molecules. In 1939 Pauling's ideas were bundled into a book that was uniformly recognized as an instant classic. And in 1954, twenty-eight years after his first fateful trip, Pauling would return to Europe to receive the Nobel Prize for Chemistry, awarded for "research into the nature of the chemical bond and its application to the elucidation of complex substances." An illustrated, forty-nine page account of the development of the nature of the chemical bond, a benchmark in chemistry, derived by Linus Pauling in the early part of the 1930’s. Read Narrative. A wealth of primary sources - over four-hundred letters, manuscripts, photographs, published papers, audio-visual snippets and more - provide an important scholarly perspective on the chemical bond story. View All Documents and Media. Alternate View: Image Catalogue A detailed, illustrated look at all of Linus Pauling's personal and professional communications and activities for each day of the years 1930 through 1939, and 1954. Presented in user-friendly calendar form. 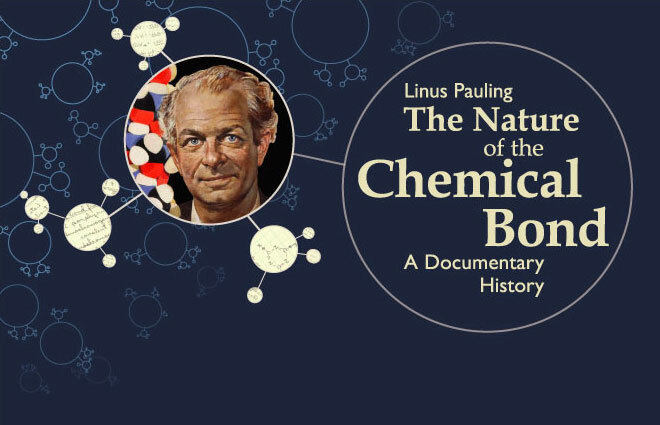 Browse Linus Pauling Day-By-Day. Ava Helen and Linus Pauling Papers, Oregon State University Libraries.